We have got the two main surgery options of gastric bypass and the sleeve gastrectomy. You need to know the benefits and risks of each so that you can make the best choice. Each of these surgeries has a different metabolic effect so we look at the changes that will happen in your metabolism and driving the weight loss. The gastric bypass is going to have the most dramatic changes and the sleeve gastrectomy the same or a little less amount of changes. Then we are going to need to make up for it by changing our diet. Essentially, here we have broken our dietary program into 11 dietary changes that you can make. For the sleeve gastrectomy, eight of these eleven changes are needed. For the gastric bypass, with the most dramatic metabolic effect still requires six of these changes. It is an important concept that for patients with gastric bypass, this does not allow you to eat freely even though it has the most significant metabolic effect. If you are going to reach that goal weight and maintain it for the rest of your life, there is still the requirements of eating lots of fruits and vegetables, moving your body, walking & staying active, eating nuts not junk food, minimizing the amount of grains & starch & wheat products that you eat. But it does have the most efficient and requires the least modification of your diet. When we look at weight loss, RNY gastric bypass has the most weight loss. With the sleeve gastrectomy, we see a little bit less weight loss – typically around 15 to 20 pounds less weight loss than we do with the gastric bypass. So when we talk about how to decide which bariatric surgery is suitable for you, here are the general guidelines. There are certain patients who will benefit from one procedure over the other. So in summary, patients who are diabetic or who have severe acid reflux (lifestyle altering acid reflux) should strongly consider the gastric bypass. 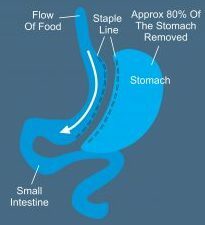 Patients with a lower BMI (less than 45 / 50) or extensive previous abdominal surgery with multiple incisions, multiple reoperations, lots of scars across the abdomen should strongly consider a sleeve gastrectomy. Dr. Matthew Weiner – How do I choose the right bariatric surgery?